Chuck Pagano, head coach of the Indianapolis Colts, has become one of the most inspiring, intriguing personalities in the game of football. Only three games into his rookie season in 2012, Pagano was diagnosed with leukemia, sidelined by the side effects chemotherapy and months of recovery. Undeterred, Pagano didn t let the confines of his hospital bed keep him from coaching: texts, calls, and emails kept him in constant contact with players, staff, and assistants. Motivated to be just as strong and determined as their ailing coach the team started winning game after game, compiling an impressive 11-5 record. The players weren t the only ones touched by Pagano s hope and strength of character. Inspired by the tenacity and toughness of their beloved coach, a newcomer to town, thousands of fans united to form Chuckstrong, a movement that soon raised millions to help beat cancer. Pagano, fueled by his faith, his family, and his love of football, returned to lead the Colts to another winning season and the divisional playoffs in 2013. 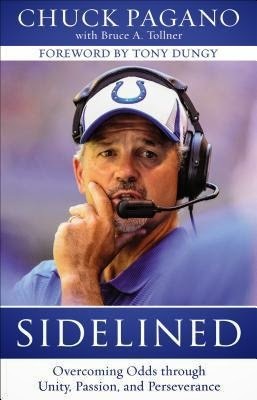 With Pagano's practical lessons on living, loving, and leading, Sidelined, which includes an 8-page color photo section, inspires us all to stay in the game and never accept defeat. "But regardless of our circumstances, they do not define us - not unless we give in and let them. Circumstances never determine who we are; they reveal who we are." Book Blast: Do I Bother You At Night?